Andrea is Whitefin’s Captain. He was born in Padova – Italy 58 years ago. He started sailing at the age of 11 years on his familiy’s boats. He graduated in mechanical engineering at the University of Padua and was industry director for many years before devoting himself full time to boating. He has always spent his free time sailing, especially in regattas , obtaining more than 80 trophies in all national and international sailing classes. With more than 50,000 miles sailing in the Mediterranean sea, he knows in detail coasts and harbors of Italy, Croatia and Greece, the destinations proposed for Whitefin cruises. He has a sunny and sociable character, always ready to engage guests and friends in the art of navigating. Sailing enthusiasts with Andrea will learn all the techniques of sailing and will be ready to face the experience of racing perhaps even on board Whitefin. He plays the guitar and loves all motorsports. In his spare time he practices motorbike off-road, skiing and gardening. He is very dynamic and you will find him always busy in many activities. Native Italian, Andrea speaks fluent English and French discreetly. He has the title of RYA/MCA Yacht Master Offshore with Commercial Endorsement – STCW95. Claire is the chef of Whitefin, she was born in Clermont (France) 25 years ago. She loves to travel and in fact during the past four years he has visited many countries of the world both from the sea on a sailboat and from the mainland. She has been passionate about cooking since she was a child and in recent years she has specialized in cooking on board of sailing yachts. Her menu is particularly varied as she could enrich her menu with experiences and inspirations absorbed during her voyages all over the world. Her dishes are always made with fresh and natural ingredients. Mediterranean and Caribbean cuisines are her specialties. Claire is also an active member of the crew during sailing maneuvers. Above or below the water, she feels like home, an absolute ocean lover. She is a sociable and curious girl who loves to be always projected to learn new things. Claire is French mother tongue but during her travels she learned English and Spanish. Now she is also learning Italian. Pietro is one of Whitefin’s deckhand. He was born in Gattinara, Italy in 1998. He is studying Nautical Engineering at the University of La Spezia. His experience with sailing began near his home, on Lake Maggiore, where he started competing in the local championship. Then he sailed on the sea of the beautiful Sardinia. Since he was a child up to the age of 17 years, he has practiced competitive swimming. Later he practiced swimming in open water in the lakes, participating in numerous competitions. He holds the lifeguard patent. Pietro is a friendly person and always available to help anyone. He is very dynamic: he loves many kinds of sports (swimming, skiing, montainbike, crossfit), and manual work. 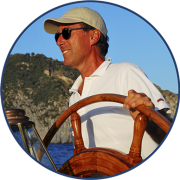 He had his Unlimited Italian Sailing License and STCW95 in 2019. His mother language is Italian and he speaks English and basic French. Mattia is one of the deckhands of Whitefin. He is a 29 years old Italian sailorman. He started sailing in the lake and soon he approached the ocean with a very strong passion for sailing. After the first steps on the dinghies, he obtained the boat license so he started working as sailing instructor for several years. Then he embarked on several sailing yachts and participated in several regattas in the Mediterranean sea including Italy, Greece and Malta. In 2018 he crossed the Atlantic Ocean from Portugal to Newport. He is passionate about holistic and oriental disciplines, he practiced martial arts, athletics and swimming. He speaks Italian and his English is fluent. Mattia is a sunny person, he likes cooking and reading. He will be soon a Yacht Master RYA.